Human Rights Watch says Syrian government forces used deadly nerve gas in four recent attacks. Syrian government forces used deadly nerve gas in Khan Sheikhun and in three other recent attacks, Human Rights Watch said Monday, according to AFP. The group said the said this showed a "clear pattern" of chemical weapons use that could amount to crimes against humanity. President Bashar Al-Assad's forces are also stepping up chlorine gas attacks and have begun using surface-fired rockets filled with chlorine in fighting near Damascus, the group said in its new report. "The government's use of nerve agents is a deadly escalation -- and part of a clear pattern," said Kenneth Roth, Human Rights Watch's executive director, according to AFP. 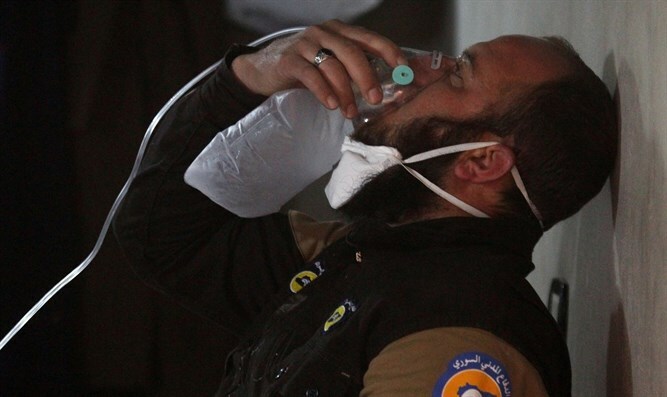 "In the last six months, the government has used warplanes, helicopters, and ground forces to deliver chlorine and sarin in Damascus, Hama, Idlib and Aleppo. That's widespread and systematic use of chemical weapons," he added. Human Rights Watch interviewed 60 witnesses and collected photos and videos providing information on the suspected April 4 attack, and on three other alleged uses of nerve gases in December 2016 and March 2017, AFP reported. The group said at least 92 people including 30 children died from exposure to sarin in Khan Sheikhun and hundreds more were injured. The Syrian Observatory of Human Rights has put the death toll at 88. In addition to Khan Sheikhun, Human Rights Watch said, 64 people died from exposure to nerve agents after warplanes attacked territory controlled by the Islamic State group in eastern Hama on December 11 and December 12. Activists and local residents provided names of the victims, while Human Rights Watch interviewed four witnesses and two medical personnel about the alleged attacks. A third suspected nerve agent attack in northern Hama on March 30 caused no deaths but injured dozens of civilians and combatants, according to residents and medical personnel, the report said. Citing mounting evidence of repeated chemical weapons use, Human Rights Watch said the UN Security Council should once again ask the International Criminal Court to open a war crimes investigation. Such a move by the council in 2014 was blocked by Russia and China.